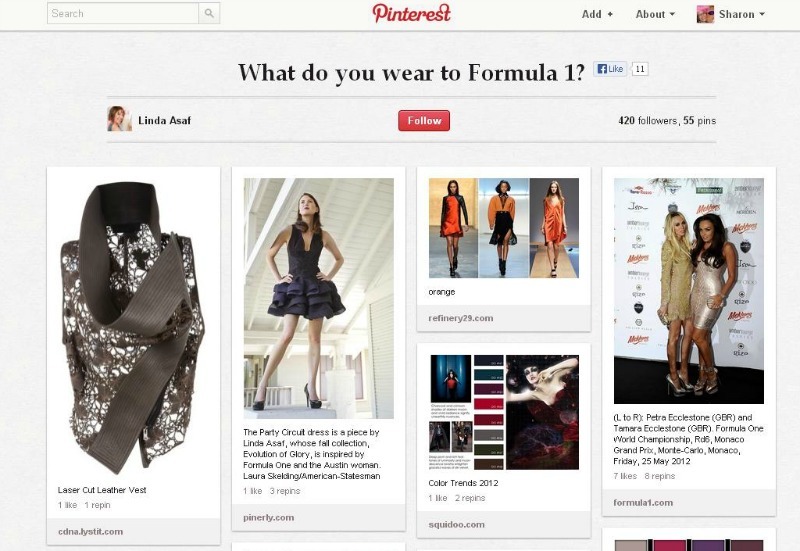 What do you wear to the Monaco Grand Prix? 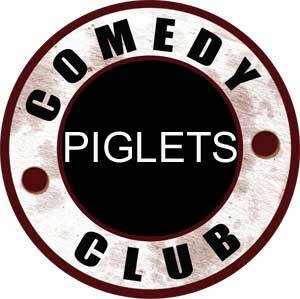 Tonight Mr Piglet and I are off to watch the trials at the Monaco Grand Prix. It’s a work do so we’re not paying for anything (and hence why we’re going!) and I’m really looking forward to it. … but not as nervous as about what to wear to the Monaco Grand Prix!! I certainly don’t have anything remotely like these clothes and definitely don’t have the figure to pull them off. – NO shoes that fit which could be worn with such an outfit anyway. Since pregnancy my feet have never gone back to their size 41 (yup big feet) and I am now a size 42 which rules out shoe shopping for me in France. So I’ll probably go in my black kit; black trousers, black top, black throw-over, black sandals and black sunglasses. Nothing quite like that depressing feeling you get when you realise that you are a frump and only have frump clothes left in your wardrobe. If you’ve had a baby, gained weight and have ever felt frumpy, please share any tips that you may have to help add a bit of glamour to my outfit! Right now my wardrobes are A LOT emptier! I can finally see the wood from the trees and find something fairly quickly that fits when I open up the doors. Bizarrely Ebay didn’t work out too well, I sold a fair bit of stuff but it was almost like my fellow ebayers thought they were buying from a shop. Numerous were the emails I received asking the measurements of this top and that dress, what the washing instructions were etc etc. I mean for goodness sake, a top at 1 Euro surely you can afford to take a chance especially as it’s from a standard shop? My wardrobe challenge did work out nicely though as I a few local girls were very interested in my stuff and took a load off of me as did a family member. I was pretty jealous as I saw her trying on stuff and looking good in it, I felt a pinch of my heart recalling that yes, I was actually that slim once upon a time (actually not so long ago). If you remember I embarked on my wardrobe challenge in a bid to motivate myself to lose weight and go shopping for new clothes. Progress on the weight loss front has been slow and steady, I have gone down three notches on my belts and am finally able to wear some normal clothes rather than just maternity stuff. Yes, nearly a year after giving birth! My current aim is to be a dress size smaller before Baby Piglet’s first birthday. Lots of people ask me what diet I am following and whilst I have been tempted on several occasions to do Weight Watchers or other diets, I prefer to re-educate myself, eating sensibly and smaller portions that way I don’t feel deprived and can still indulge occasionally. After all, what’s the point of being a foodie if you can’t eat it? Do you have any weight loss tips to share? Can you believe this was me just five years ago? Wondering if I'll be this slim again? SOLD!! The city pad is sold!! We finally accepted an offer that put an end to negotiations on Monday morning and can confirm that come January, if all goes smoothly, the Piglet family will be homeless unless we find something quick! As is always the way, as soon as we had agreed a price (less than the asking price but nonetheless a price we are happy with) we got a call from another interested person, an international footballer! Tempted by the money but morally aware that the property was already sold, we politely, but regretfully sent his agent packing. I don’t think they’re used to being told that sold means sold and not if they pay more then they can buy it! Anyway, at least we know we made the right decision on a moral basis even if it was a hard one to make financially. In anticipation of the sale, Mr Piglet and I started house hunting on Saturday. We had spent some time looking on the internet but had not started really looking as I am very superstitious and didn’t want to jinx selling the property. I could not imagine the heartache if I’d found the perfect property only to not be able to buy it because we hadn’t sold. Arriving in the village I desperately needed the loo (being pregnant meant that Husband did not moan for once!) so we stopped in the village bar for a coffee. Entering the small room, I was overwhelmed by the stench of cigarettes and alcohol – it’s been a while now since smoking was banned in bars and restaurants but that law has obviously not reached parts of rural France as yet. I glanced around, taking in my surroundings and saw a woman about my age showing off her new purchases to some other women in the bar. Thrilled at the thought of sharing a shopping addiction with other villagers I looked on. 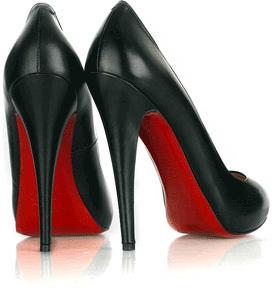 Now, I’m no fashionista, but the excited exclamations and squeals of joy she was receiving lead me to believe that she had acquired a pair of Louboutins or similar coveted footwear, and incited me to take a closer peek into the box she was holding. What a shock! The contents were silver, sparkly trainers! Not quite what I was expecting! It was daft of me to expect someone to have these in rural France! As I continued to scan the bar area, my eyes were drawn to a caricature of a man, the type of person I’d always expected to see in France when I was about 10 but who, rather disappointedly in reality doesn’t exist. 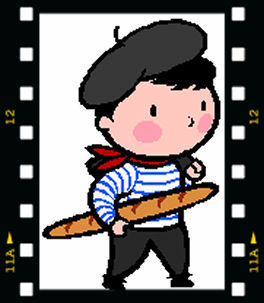 You know, the man with the beret hat, the mariner t-shirt, closely cut hair and brightly coloured belt? Well, I had to do a double take, as this guy at the bar was exactly that, the typical French guy that I believed didn’t exist. All that was missing was a baguette and some onions. He was drinking Pastis (at 1130 am) and was discussing hunting so maybe the lack of baguette and onions can be forgiven as he’d obviously not caught anything so wouldn’t be making lunch. Afterall, that would explain why he was in a bar drowning his sorrows in Pastis! Feeling rather out of sorts in the bar, Mr Piglet and I left rapidly after downing our coffee, bemused by the characters we had encountered. Was village living really going to be the right thing for us? Then again, I’m sure if we went into any bar in Lyon at 1130 in the morning we’d meet some strange souls so we decided to discount this experience as being unrelated to country living. As for the properties we visited, all I can say was the trip was a waste of time and nothing was suitable. The first property was being advertised as habitable and requiring comfort refreshing (ie. Decoration) yet, walking around I was scared stiff that the ceilings were going to cave in, that I would be electrocuted or the floor would give way. The second property was being advertised as being 200 m2 and as having outbuildings, but reality again turned out to be different. Entering the front door, I was immediately confronted with a close up view of the back door. Now, I’m a bit short sighted and things normally look quite far away, but the back door was only 5 metres away from me! The kitchen was a non-existent black hole and the bedrooms could only be called single box rooms at best. Not quite what I was expecting! At best, we estimated the house measured no more than 140 m2. As for the numerous outbuildings advertised, there was one, measuring 20 metres squared on the ground, so maximum extension potential of 40 m2! Our quest for space may seem excessive but when both spouses work from home, an office in the spare bedroom is not really practical, so we need space to work, to live and to welcome house guests especially now that we have a mini us on it’s way! All in all, a disappointing first outing. Our next visits are being planned with military precision and hopefully, just hopefully, we will stumble upon the perfect property very soon otherwise we really will be homeless! ps. I did take some pictures but they’re stuck on my camera for the time being and don’t want to come off! I’ve been feeling a bit depressed about my weight recently and have been completely unable to shift the excess kilos. Any efforts at dieting have been short-lived and resulted in adding to my surplus rather than reducing it. My ludicrous attempts to loose 10 kilos in 10 weeks (see this post) were quickly thwarted by life, and I actually managed to put on 5 kilos along the way! I have tried to take some steps to loosing weight in the recent weeks. I used to be a dancer. It doesn’t seem like an eternity ago but it must have been, as after a 40 minute drive across town to a dance studio I’d found on the internet I was bitterly disappointed. As I walked in I realized the receptionist and all the dancers loitering around were about 18 and made me look ancient. They all looked like extras from Pineapple Dance Studios, and I looked just like Louis – the old one (if you don’t know about Pineapple then have a look at some of these videos, they’re a scream!Pineapple Dance Studios on YouTube). The receptionist showing me around asked how many years ago it had been since I had danced. Note: Not just how long ago, but how many years ago… She kindly advised that their lessons were not really for beginners (she obviously didn’t believe that I had once danced professionally, albeit on ice!) and invited me to attend an open day if I wanted to try… it was a nice let down but I’m a very busy lady and 40 minutes drive across town is just too far and too much time in the car to reflect on the fact that I can no longer move as I once did. 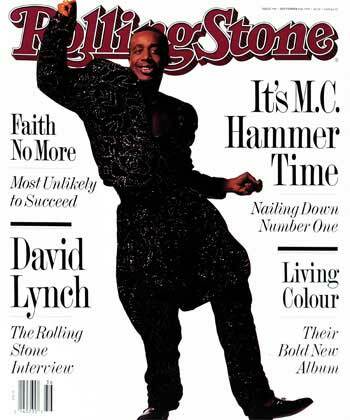 Things came to a head on my holiday in Portugal when I was forced to wear MC Hammer style pants under dresses, as my dresses had turned themselves into tunics and had become indecent to wear in public. The MCH pants were actually supposed to have been tracksuit bottoms (but are actually harem pants or so I’m told) which I was expecting to wear elegantly with high heels. Not so. Determined to look better, get fit and loose weight without being so strict that I set myself up for failure as I did last time. So, last Monday I set myself a target of loosing 4 kilos in 4 weeks before my next trip. To celebrate the setting of a realistic target, Hubby and I order Pizza Domino one final time and then weighed ourselves the next morning, hopefully being at our heaviest. 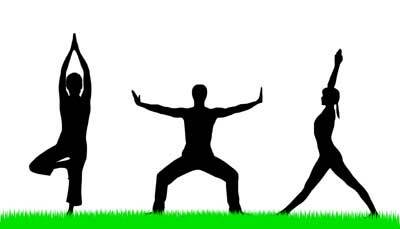 Not just content to do a gentle diet, I decided to embark on a keep fit routine as well and this, my dear readers, in where things started to unravel at an alarming rate. Tuesday night: 30 minutes on the cross trainer followed by floor exercises and weights. At some point the blood circulation in my feet was cut off (my feet are too fat for my trainers?) and I lost all sensation in my toes! Manically rubbed my feet after and eventually all feeling came back. Great! This might just work, or so I thought. Wednesday night: Time to add some diversity to my routine. If you’ve bought a packet of Fitness cereal recently (yes, this is how serious I am, even my breakfast cereal is called Fitness!) you would’ve received a free Les Mills DVD; Either Body Balance or Body Pump. I’d managed to eat my way through two boxes so had both DVD’s. I’d heard great things about these DVD’s so aching all over from the day before (don’t laugh, because I couldn’t so much my abdominal muscles hurt), I motivated myself to get stuck in and popped the Body Balance on in the machine. Setting: Living room, yoga mat on floor, television playing fitness DVD, a mixture of Yoga and Pilates. Character: Piglet, dressed in holey tracksuit, bare feet (trainers too tight) and looking motivated. Spare tyre round middle held in place by too tight t-shirt. Scene 1: Lady on DVD starts demonstrating the routine, Piglet to follow. Downward Dog. Grunt. Lady effortlessly slides from position to position, throwing in a plank from time to time. Piglet scrabbles around on all fours, bum in air, back on all fours in order to stand up, whoops, she’s toppled over. Another grunt. Ridiculous laughter. She tries to do the Plank but fails miserably and then splat on her face. Scene repeats. Scene 2: 15 minutes later. Frightfully fit ladies on DVD still doing graceful pilates moves. Piglet still flailing around in all directions. Time to lie on front on the floor. Extend arm and opposite leg, bend both and grab foot from behind. Piglet’s body will not move, hand grapples frantically trying to find foot. Ladies on DVD carry out said move with elegance, Piglet falls over without having held foot. 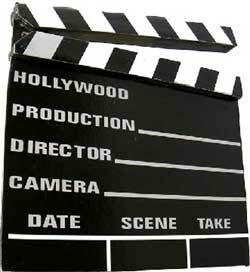 End Credits: Ladies on DVD are honed, toned and fighting fit. Piglet cannot get back up. Stays on floor. Crys. Is old. Spare tyre still there. Yep, that’s right; I must have done something wrong as I wasn’t able to walk for three days after! Imagine the old ladies you sometimes see at the Dr’s surgery or at the market. The one’s wearing the contention tights and super sensible orthopedic shoes because they’ve had a hip replacement job? Well I was walking just like them. I couldn’t stand up, sit down or even turnaround without being in dreadful pain so I had to add to the hole in the French social security budget. Miracously my hip is better now, but the Dr wants me to get an x-ray to check it out as he thinks there could be some joint damage. He’s also banned me from any sporty activity for the time being. Is this what ageing is about? And what about loosing weight? If you’re female and in France right now, the likelihood is that you’re breaking the law as you’re reading this. Not because my blog is illegal but because you’re wearing something illegal. Whilst the Burqa hasn’t as yet been outlawed, women wearing trousers has and has been for a long time now. Due to an archaic law dating back to 1800 women wishing to dress as men (this is wear the trouser wearing part comes in) are supposed to request authorization from the police first. A later amendment to the law allowed women to wear trousers if holding horses’ reins and then a further amendment was made for those riding a bike. Technically, if you’re not carrying out any of the aforementioned activities you’re in illegal territory. The icing on the cake has to be that even as recently as 2003 when a request was made to the French Equality minister for the law to be changed, they won’t do it. So much for a country which tries to promote gender equality! When we were living back in the UK for a few years, I often used to reminisce on how much I missed French markets. 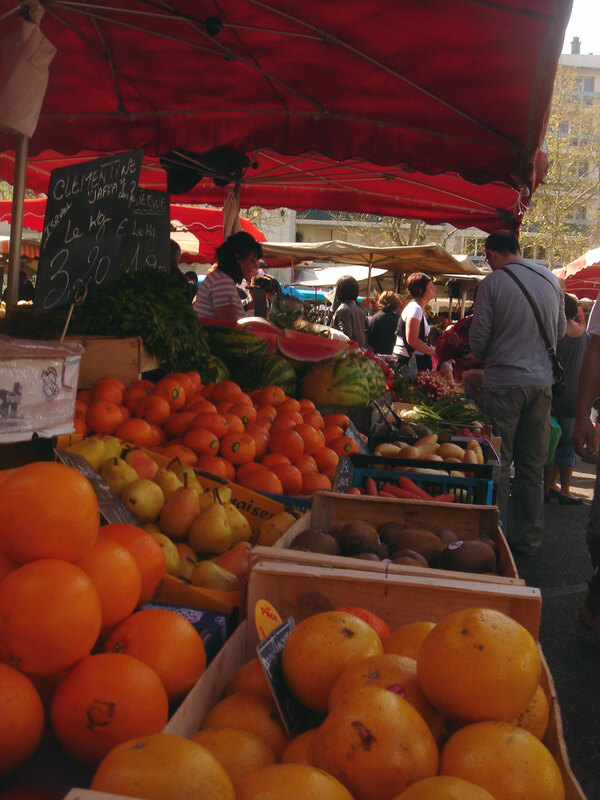 Whenever we came back to France for holidays or business, I would always be quick to identify where the nearest market would be and would do everything I could to ensure I was able to go. Hubby would often then be quick to point out that when we were living in France I’d never go to the market, except on the rare occasions my parents came to visit. Yet, I had the option to go if I wanted. Where we based in the UK that option didn’t exist, the only markets we had were once a month when we were lucky enough to have a farmers market – but you cannot compare the measly show of produce at the farmers market with the fabulous 5 sense experience of an authentic French market. So, yesterday, I had a ‘I’m going to live the French life’ moment. I hauled my sorry backside off the sofa at the very unheavenly (for me) time of 9am and got dressed up for market day! Getting dressed up didn’t mean heels and lippy for me as it would for many French women, but I lost the Crocs and put on a trench instead of a fleece. After dusting off my bright orange shopping trolley (always known to me as a Granny bag), off I set, avoiding the cumbersome dog poop on the way, to visit my local Villeurbanne market in Les Grattes Ciel. The sun was shining and as I advanced on my walk the streets got busier and busier. So much for the super chic French women I was expecting to encounter though, this was more the polyester and viscose parade. Obese women dressed in brightly colored bags hanging over their bodies and looking like they’d gone out in their slippers. So much for loosing the Crocs! Okay, so Villeurbanne isn’t exactly the 6th Arrondisement its Lyons poor neighbor or sometimes falsely called Lyon’s 10th Arrondisement. Les Grattes Ciel is the quartier where I live; it’s a perfectly acceptable working class neighborhood traditionally inhabited by Italian immigrants and built during the Art Deco era. I’m slumming it here market wise though, my Beaux Parents (doesn’t Beautiful Parents in French sound better than the In Laws in English?) 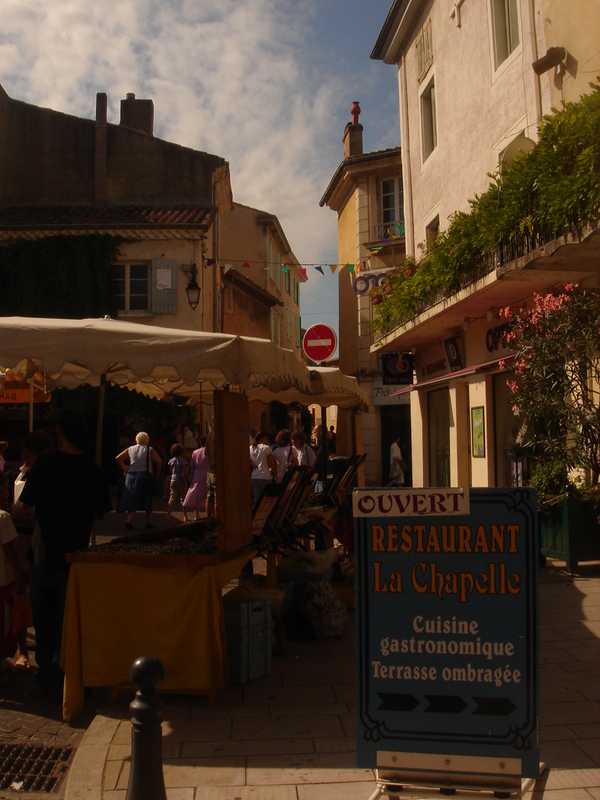 live in Provence and we’ve always been spoilt for choice on deciding which market to go to whenever we visit them. As they’re surrounded by beautiful villages and markets they’ve become a bit blasé about the whole thing, but they still humor me 11 years on whenever we go to visit even. It has to be said the markets in Provence are absolutely fantastic. Back to my market. Approaching the market I stop to get cash and avoid my first two beggars (mendiants) next to the cash machine. Cash in purse, I continue, dodging the Polyester Brigade and continuing with purpose. Next I’m asked to vote for someone about our pensions and I politely explain to the bewildered man that I don’t have any right to vote so it’s useless him talking to me, then I avoid no less than two more beggars before finally arriving in the market. This market doesn’t take place in a fancy market square, but in large car park flanked by scrubby buildings on one side and the back of the Art Deco buildings on the other. My first sight of the market was not, unfortunately for my eyes, wonderful displays of fruit and veg, but polyester tops costing no less than 5 Euros. I had arrived in the clothing section. Fighting my way through bustle of the clothes section and mildly interested in the cheap socks for sale (until I remembered they’d probably be made from polyester instead of cotton) I battled my way into the food section. Relief. This is what I’d come to savor. Fresh produce all around me, the beautiful reds of the tomatoes, greens of the peppers, and hold on what is this? Yellows of bananas? All the way from Colombia! It was surprising how much stuff was imported, so much for buying local, seasonal produce for tuppence. I was in luck though and I continued on my mission filling up my trolley as I went along. A whole pan of green chilies for just 1 Euro, even a free lemon on when stand when I said to the lady that she could keep the 4 cents change she was due to give me. A mental note was made of the delicious smelling spice stand I saw as well as the fishmongers and butchers. I didn’t need any of this yesterday and didn’t buy as I’d already planned my meals but it’s good to know if it is needed. I did manage to spend over 20 Euros though and I have a Granny bag full of stuff that I’m not yet sure what I’ll do with, but it was good fun and I felt healthy. I was embarrassed to take pictures as this certainly wasn’t your traditional tourist market. People were not lingering here, no-one was having a gentle traipse around the market for something to be done, everyone had a sense of purpose and I didn’t dare take too many photos for fear of being branded a fool. Why I was worried what people thought I don’t really know, but I did manage to whip out the photo whilst paying at one stand so I could share here. Not the best photo you’ll see of a French market though! Les Grattes Ciel Market - A rather nice stall. 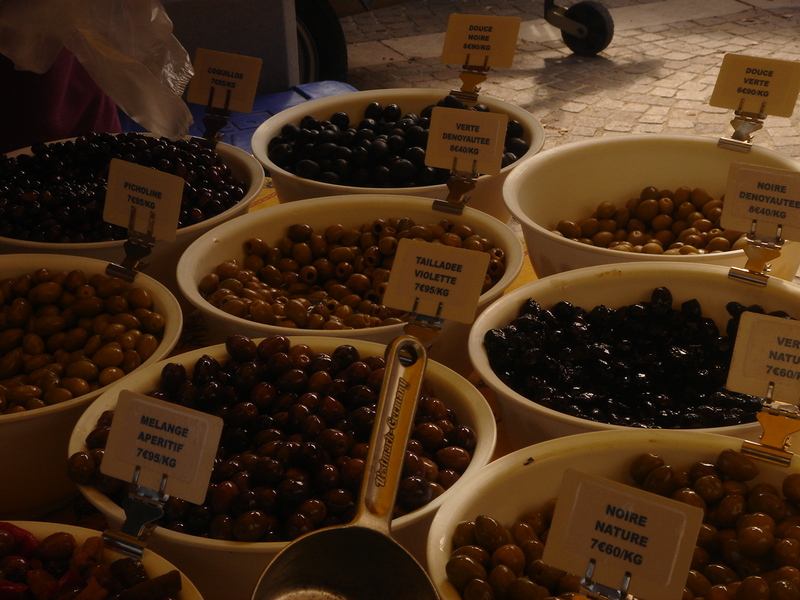 Seriously lacking for me were the delights of the Provencal market; the fresh olives and tapenade stands, wine, saucisson even cheese. But I’m happy with my market, whilst the clothing is not to my taste from what I immediately saw, it merits to be explored but maybe on another occasion. As for the food, well functional and exactly what I needed and who knows, as we advance into the summer maybe the produce will become more seasonal as I’m not sure much is even grown in April anyway.